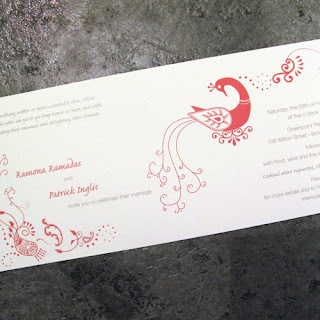 Our newest wedding invitation design is this lovely "henna inspired" invite. The bride and groom wanted to incorporate some Mehndi artwork, including a peacock, which symbolizes love and fertility, so we came up with this design, a simple flat card, with the peacock design organically flowing through the text. 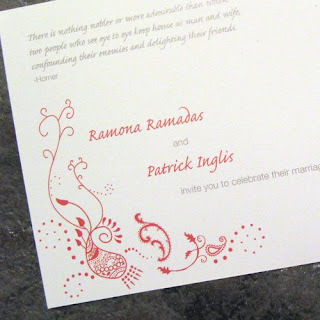 The invitation was printed on a bright white eggshell card stock, with matching white envelopes. Congratulations Ramona and Patrick! I love your shop I have seing it on Etsy . I have an etsy shop love your stuff.... Any interest in selling my stuff at your store:).